Hawks sneak "Gunfight at the OA Corral"
If ever there was a fight to the death, it was the gunfight at the OA Corral as Hawks shaded the narrowest of wins against an unlucky Edinburgh Accies side. The home team were down by two points well into injury time when George Horne kicked a penalty which secured a very precious 4 points for the West End side. 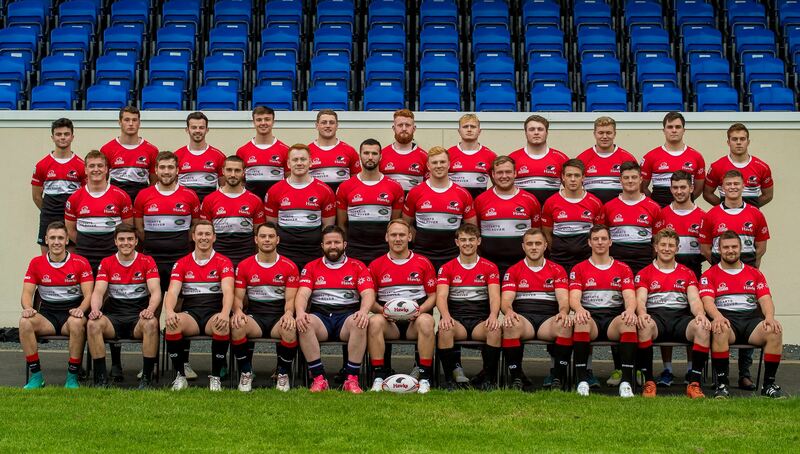 It was the basement battle as Accies, who have yet to secure a win this season visited Old Anniesland to challenge a Hawks’ side which had slipped down to 9th place last Saturday at Brifgehaugh. The one way nature of the match continued as the number of unforced errors against Hawks continued to grow. In desperation in defence they were penalised a number of times for going over the ball on the deck. Another period of sustained pressure had Accies scrumming inside the home 5 metre line and they were putting a real squeeze on Hawks. It was a testament to the packs play that they forced the turn-over and Horne cleared what looked like another try. The joy was short lived as a minute later Andy Kirkland received an extremely harsh Yellow Card for use of the feet. It looked innocuous enough, although the referee possibly had a better view of where the prone player’s head was. With 10 minutes to go, there was a fear that that this could open the flood gates, but Hawks rallied and whilst they offered a limited threat they easily frustrated Accies in the run up to half-time. The second half was 6 minutes old and it was game on. Hawks battered away at Accies and whilst the visitors were competing they were getting slower to every ball and Hawks appeared to have the advantage in terms of fitness. Still the try line remained elusive. The side could see the winning line in 65 minutes Davidson made a break through a tackle and took the pack with him deep into the Accies half. Similarly, Warrior, Tyrone Holmes took a ball against the throw from the back of the lineout just in his own half but somehow Accies scrambled backed. Now any score for Hawks could win it. Hawks got back on the offensive, a penalty just inside the half saw Boyer take a sharp tap running the ball 20 metres, again a desperate Accies defence scrambled back to make the tackle. There was a chill in the house as Accies, hearing Marley’s chains and the ghost of narrow losses past started to rattle through their heads. Hawks had the ball in Accies, whilst nothing looked like Hawks were going to score there was still the aroma of fear from the Edinburgh men. .
Hawks appeared to be preparing to take a drop goal as Horne stood back in the pocket, but that ball was never fast enough, to let him have a pop. The clock was well past regulation and the teams were playing at the referee’s discretion when Hawks conceded a scrum to Accies. Play this out and the Edinburgh side would have their first win. The sides packed down and Edinburgh put the ball in, they seemed to have the strike, when the packs popped up. A neutral might suggest that the scrum should be reset but the Referee thought that Accies were at fault and blew for the penalty. About 10 metres to the right of the hockey pitch end posts and 18 metres out, Horne placed the ball on the tee, stepped back and launched the match winner. It was 14-13 and the whistle blew for half-time. 4 points to Hawks with a 3rd win in 7 and a ten point gap over Accies.